Trichodesma indicum is a erect herb found as a weed common in roadsides and on stony dry waste lands. throughout the greater part of India. We call it as "Kavil Thumbai" in Tamil. The decoction of the root and leaves are used for diarrhea, dysentery and skin diseases. This study was evaluated with few animal models in regards to diarrhea. The extract significantly inhibited the castor oil-induced diarrhea. 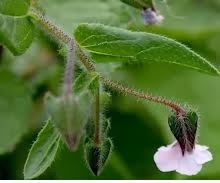 The ethanol extract of Trichodesma indicum root has significant antidiarrheal activity and substantiates the use of this herbal remedy as a nonspecific treatment for diarrhea in folk medicine.